Eco-living made easy with these helpful tips. Reduce, reuse and recycle is the mantra of green-living advocates, but what you bring into your home is just as important as what leaves it. Most parents are taking steps toward “eco-living” as being environmentally friendly becomes easier and more convenient. With Earth Day on the horizon (April 22), this is a great opportunity for families to reinforce their practices, ranging from the food they eat to the products they use at bath time. Rebecca Reynolds Wallack of North Olmsted is an ­organic lifestyle expert and environmentalist with 30 years of experience in the wellness industry. She’s also the owner of Green Clean, an organic cleaning company that also manufactures its own line of safe, organic, refillable cleaning products to protect people, pets and the planet. One way to keep safe is to avoid fragranced products. “That can mean over 200 chemicals are in the item, and they are often the most toxic of all ingredients,” Wallack says. A better choice, if you must have something with an aroma, is to use shampoos, soaps and other products that contain essential oils. – Drink from reusable bottles. – Bring your own carry-out box to restaurants. Green living for families can be as easy or as involved as you choose. From the organic (and local) eggs you serve at breakfast to the stories you read at bedtime, the options are almost endless. The Earth Day Network is a Washington, D.C.-based ­organization that promotes healthy, environmental living. The group’s Alex Standen says their suggestions are to use less disposable plastic, unplug appliances when they are not in use, reduce the temperature on hot water heaters and take steps to reduce the amount of junk mail you receive in your home. 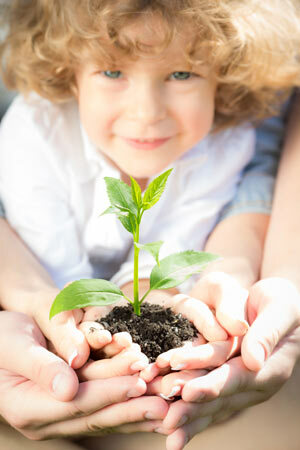 Earth Day and its many activities are tailor made for families. It began in 1970 as the foundation of today’s environmental movement. Earth Day, which is celebrated in April, is now marked throughout the world with tree plantings, outdoor cleanup projects (think rivers and parks), educational programs and other events. This year’s global theme is “Green Cities.” Check in your area to see if your community has something planned. Cleveland, for example, is hosting EarthFest 2014 from 10 a.m. to 5 p.m. on Sunday, April 13, at the Cuyahoga County Fairgrounds. The event includes 250 exhibitors with nine sustainable areas including family fun, health and fitness and zero waste. Children will especially enjoy the bio-diesel-powered amusement rides and urban farm animals. Another example is at the Kent State University Stark Campus in North Canton, which is hosting a free event from 1 to 4 p.m. on Sunday, April 27. The day includes a wide array of environmental activities such as a geologic time scale, a mock fossil dig and nature walks. There are things every family can do to reinforce what children see at a special Earth Day event. Some are simple from reading a book to other ideas that require a bit more diligence from the family. Ellen Eckhouse, owner of The Village Book Store in Garrettsville, said Earth Day makes her think of books about trees. A few of her ­favorites are the Caldecott Award winner “A Tree is Nice” by Janice May Udry, “Thea’s Tree” by Alison Jackson and the bedtime book “Snug as a Bug” by Michael E. Ross. Non-fiction selections include “And So They Build” by Bert Kitchen, which features beautiful illustrations of various ­animal nests and homes and “Linnea’s Windowsill Garden” by Christina Bjork with do-it-yourself garden ideas. It’s also easy to get even the youngest family members involved in simple Earth Day activities that carry over into the rest of the year. Children can sort papers and drop them in appropriate recycling bins. They can learn about trees and then plant one in the yard. Each year, they can measure the tree as it matures. Also, parents can encourage kids to spend more time paying attention to nature.